From the cast on edge and all the way down the leg to the beginning of the heel flap, the Naughty Green Socks have 3,864 stitches*. Each. Maybe I didn't need to know that. *I had the numbers wrong - they actually have 4,416 stitches. EACH. July 9, 2011 at 12:09 p.m.
Yikes. I guess us sock knitters are gluttons for punishment, lol. July 9, 2011 at 2:42 p.m. So, in the middle of the night do you wake up with a brain worm saying, " 3,173 . . . 3,174 . . . 3,175 . . . "
July 9, 2011 at 11:28 p.m.
Ok, step away from the calculator. Now get some wine... There you go. Isn't that better? July 10, 2011 at 8:25 a.m. There are lovely though. Counting stitches has not helped me with my last two projects. I just get discouraged! July 10, 2011 at 11:54 a.m.
Jumpin' Jupiter, Jane...don't you know, we're supposed to count rounds, not stitches?! Exactly what I was told when I counted the stitches in a pair of socks last fall. Didn't help, until I discovered 6-ply sock yarn! July 10, 2011 at 9:37 p.m.
That sure is an interesting fact ;-) Like the greens and stripes! July 11, 2011 at 9:10 p.m. So pretty! 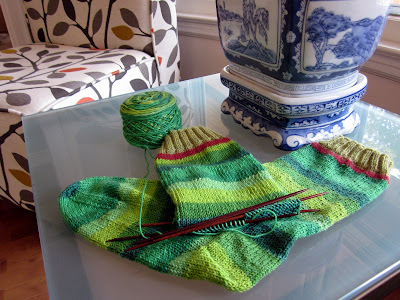 I need to learn to turn a heel dammit!! Love your work! July 12, 2011 at 11:18 a.m.
July 12, 2011 at 4:52 p.m.
July 13, 2011 at 12:01 p.m.
July 14, 2011 at 11:04 a.m.